Rare gardener does not grow in your summer cottage onions, as this vegetable is not very capricious in care. But there are some tricks. It's time to explore some of the nuances and valuable advice by which you will get a rich harvest. Surely you know that to grow onions not only in the open ground, but on the windowsill and in the greenhouse. Best of all onions grown on soils rich in humus. It requires a large amount of light. When planting onions require good soil drainage, so the soil should be minimal clay content. Prepare the ground in autumn, some digging, removing debris and stones. The spring will only slightly loosen the soil and make fertilizer with manure. The easiest method of growing onions – seed sown in the open ground. 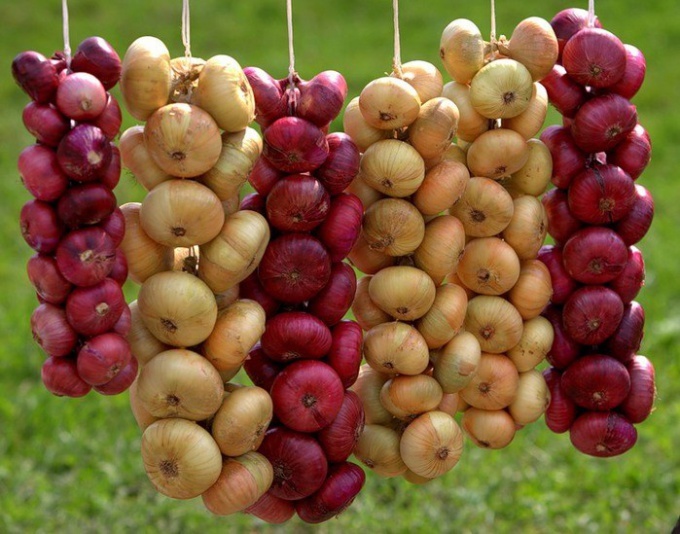 Often onions are grown from sets small bulblets, whose diameter is from ten to twenty centimeters. Carefully sort through the bulbs, remove the dried and germinated instances, patients and cut. The rest of the sets sort by size: small, medium and large. To obtain the simultaneous and harmonious growth, plant each fraction separately, it is also easier to care for plants. Protect sets of infection with various diseases and reduce the chance of its strelkovanie. This should be treatment of follicles. A week before planting warm up the bulbs within one to two days at a temperature of 40 ° C, then store at a temperature of 20-22 degrees. Soak before planting bulbs in a solution of copper sulfate 1% for fifteen minutes. It is not recommended to trim the neck of the bulbs, so you can cut already appearing Rostock, whereby the greens will get weakened and damaged. For planting and growing onions require a Sunny, open and well-ventilated area. Otherwise, the onions will grow poorly, may suffer from mildew. Recommended to plant onion in the garden, where you previously grew peas, tomatoes, cucumbers or cabbage. Plant onions in late April – early may, do not delay planting as the soil begins to lose moisture accumulated after the winter, and it starts to dry. This can have a very negative effect on the timing of germination and crop quality in General. The first shoots should appear within 11-14 days (if correctly executed landing). The scheme of planting just between bulbs in the series should be a distance of six to ten inches between the rows twenty inches. Planting depth sevka – four to six inches, the bulbs must be covered with a two-centimeter layer of earth. If planted deeper, it may eventually form oblong bulbs, and seedlings seem much later. After planting, gently pobrania a garden rake to all the planting was uniformly covered with soil. In the first two months of bow needs abundant watering, as it actively produces green feathers, then appear to head. Watch out this period the humidity of the soil, in any case avoid it drying out. It is also unacceptable to the presence of weeds in the same bed with onions. Regular and timely weeding affect the quantity and quality of future crops. Cultivation has a beneficial effect on the supply of oxygen to the roots of the plants, which is important for its development. At the end of June - early July, stop watering, allow to ripen the bulbs.